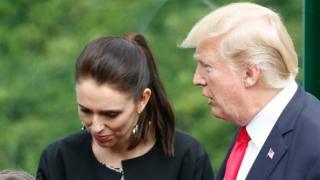 New Zealand PM Jacinda Ardern says she regrets sharing an anecdote about her recent meeting with US President Donald Trump with her friends. Ms Ardern met Mr Trump at the Apec summit in Vietnam earlier this month. On Sunday, a local comedian told journalists Ms Ardern said Mr Trump had mistaken her for the wife of Canada's leader, Justin Trudeau. Ms Ardern denied this, and said she had merely spoken about an outside observer's impression of the meeting. Tom Sainsbury, a friend of Ms Ardern's, had told local radio: "I don't know if I should be saying this, but she said that Donald Trump was confused for a good amount of time thinking that she was Justin Trudeau's wife." The interview sparked headlines in New Zealand that Mr Trump had not known who Ms Ardern was. Ms Ardern later denied this. In a New Zealand TV (TVNZ) interview on Monday, she said: "Someone observed that they thought that it happened, but in all my interactions, certainly President Trump didn't seem to have confused me when I interacted with him. But someone else observed this." She would not specify who observed the meeting, but admitted she had shared the incident with a number of friends afterwards. Grilled by a TVNZ host for several minutes, she said she had told the "full story" to her friends. She said she had given Mr Sainsbury "a shortened version" of events, but believed she had made clear it was an observer's impression of what happened. "I said there was some confusion over who I was," she said, adding that she could see now how it could have been misinterpreted. "Tom's a mate of mine. I shared a story with him, he shared it with someone else, I can see how that then spirals ... it is a trifling matter. It was "a bit of a funny yarn, something that I don't want to cause a diplomatic incident over", she said, adding: "I think I should never have recounted the story." Ms Ardern, who took office in October, has just returned from her first series of international forums as leader, including the Asean summit in the Philippines and Apec in Vietnam. The prime minister also caused some concern earlier, telling the website newsroom.co.nz how she had joked to President Trump about their respective election victories. According to the website, she recounted how Mr Trump had commented on her recent election saying "This lady caused a lot of upset in her country". "I said, 'You know', laughing, 'no-one marched when I was elected'," she told the website. Ms Ardern pointed out though that the US president did not seem offended by her comment.